Several epidemiological peculiarities of incidence of glomerular and tubulointerstitial kidney diseases and urinary tract infections among the population of the Altai region Sursyakova K.I., Saf'yanova T.V. Prognostic factors of survival rate in patients with prostate cancer Grickevich A.A., Medvedev V.L., Kostin A.A., Rusakov I.G. Rehabilitation value of correction of urinary incontinence developed after radical prostatectomy by urethrosuspension with adjustable sling Asratov A.T., Kachmazov A.A., Kostin A.A. 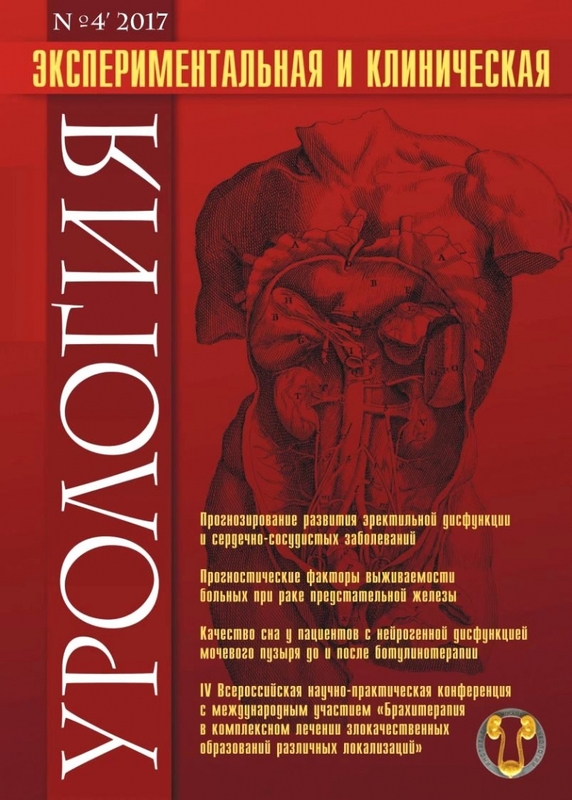 Analysis of long-term results of protective therapy during the post-operative period after kidney resection due to renal cell carcinoma Shormanov I.S., Los' M.S. Prediction of development of erectile dysfunction and cardiovascular diseases based on the risk factors profile Apolihin O.I., Efremov E.A., Shaderkin I.A., Zolotuhin O.V., Madykin Yu.Yu., Zelenskiy M.M., Krasnyak S.S.
Copulative function of patients after transurethral and endovideosurgical interventions due to benign prostate hyperplasia Popov S.V., Skryabin O.N., Orlov I.N., Grin' E.A., Topuzov T.M., Kyzlasov P.S., Malevich S.M., Sushina I.V., Vyazovcev P.V. Permixon: place of drug in pathogenetic therapy of BPH Sivkov A.V., Sinyuhin V.N. Use of chorionic gonadotropin as a hormonal stimulating therapy in patients with pathospermia Efremov E.A., Hizriev H.Z., Kastrikin Yu.V., Butov A.O, Tolstov I.S. Single laparoscopic surgery (SILS) in comparison with standart laparoscopic pyeloplasty Seregin A.V., Seregin A.A., Pankrat'ev Yu.L. Diode laser technology in the treatment of patients with benign prostatic hyperplasia Eremenko S.N., Eremenko A.N., Boschenko V.S. Optimization of diagnostics of urogenital and intestine-vaginal fistulas Eliseev D.E., Alekseev B.Ya., Kachmazov A.A., Gurbanov Sh.Sh., Ogay D.S., Holodova Zh.L., Abakumov R.S., Chernikova E.N. Sleep quality in patients with neurogenic bladder dysfunction Panteleev V.V., Sivkov A.V., Romih V.V., Zaharchenko A.V., Borisenko L.Yu., Romih F.D., Panteleeva M.V. Interstitial cystitis – pathogenesis, diagnosis and treatment strategies: an update. part 1 – pathogenesis Mirkin Ya.B., Karapetyan A.V., Shumov S.Yu. Preoperative evaluation ofseverity of malformation of penisin boys with epispadias and bladder exstrophy Rudin Yu.E., Maruhnenko D.V., Aliev D.K.